If you have ever read any self-help, spiritual or personal development books you will be familiar with the concept that you are a person on a journey of development or improvement. Fundamental to this viewpoint is the belief that you are a person – in other words that you are a separate individual. As a person, whenever challenges present themselves to you it will be necessary for you to overcome them by engaging in some kind of activity. Furthermore, how you overcome these challenges will be to utilise skills and techniques which are learned as part of your journey of individual or personal development. The essential elements of this personal approach to life can be summarised as: you are a person, a separate individual; you are on a path of development and you will need to acquire new skills in order to further your growth; it will be necessary to engage in some kind of activity in order to overcome challenges; overcoming challenges leads to an experience of wholeness. Part of the whole belief system is that acquisition and activity lead to wholeness. In other words, getting more and doing more will make you feel better. In personal development terms the acquisition is of knowledge rather than money or objects, but nonetheless it is still acquisition. This approach to life can often seem like a very slow, hard grind. There never seems to be an end to the amount of issues, conditioning, programming or limiting beliefs to be overcome and quite often it seems like the more challenges we overcome the more we are presented with. Thankfully there is another approach which can help us when we feel that walking the path of development is like walking through treacle. This other approach is the impersonal one and it is reached by realising that the basis for the personal approach – that you are a separate individual who needs to acquire knowledge and do something to become whole – is not a fundamental truth but a mental construct. Rather than seeing it as an absolute truth we can see that the personal approach is just one among many ways of looking at the same subject. The personal approach is there whenever you firmly believe that you are an individual, that you are incomplete and that you need to get something or do something to become whole. If you can accept the possibility that, in essence, you are already whole and that no amount of acquiring or doing will change who you really are, you may find the impersonal approach to be more appealing. There is an often-quoted saying of Gandhi’s which states that we need “to be the change we want to see in the world”. It often seems as though this quote is used to underline the theory that it is what we do in the world which is important – that if we want to see peace in the world we need to live peaceful, non-violent, lives. Regardless of what Gandhi actually meant to convey, the words themselves say that we need to be the change, not become the change or do the changing. This is the key to the impersonal approach. Instead of seeing ourselves as individuals with problems that need to be solved, we align our consciousness with the energy of the solution. So if we have identified that we feel unloved and we start to wonder how we can heal ourselves and feel loved, the impersonal approach says that we can align with the energy of being love. “I Am Love” then becomes the mantra for us to work with. Except it’s not just about using mantras or affirmations – being the solution means digging into a much deeper place than verbal or mental repetition of words: it requires using our will and intent. It is about knowing I Am Love and really feeling that knowing. The existence of these two approaches to life – the personal and impersonal – is like a two-lane highway with the slow lane being the personal and the fast lane being the impersonal approach. When we get into the fast lane anything which needs to happen will happen spontaneously and naturally without effort or struggle. Activity occurs as a result of the energy of wholeness rather than as an attempt to create wholeness. Things or knowledge may be acquired, but again this is as a result of being in alignment rather than the hope that such acquisition will lead us into alignment. In the impersonal lane we know that we are the true Self, which is everything and everyone. We are the Oneness. If we could stay in this lane it wouldn’t matter one bit what happened in the outer world or what happened to our physical bodies because we would be resonating with the energy of wholeness and we would know that nothing can ever stop us from being whole. The true Self has nowhere to go because it is everywhere. It has nothing to acquire because it is everything. Having discovered this fast lane, this clear channel, we find that there is now only one “challenge” to be “overcome” and that challenge will present itself to us on a daily basis: that challenge is to remain in the fast lane of the impersonal as much as possible. Inevitably we find ourselves shunted out of it and back into the slow lane, and we once again become identified with being a person with problems that need to be solved. In such a state of identification we forget that we ever knew we were whole, forget there is another way and forget how to get back into it. The knowledge, viewpoints and exercises presented in this book are intended to help you to develop the self-confidence and ability to enter into the impersonal lane at will, at any time and in any circumstances. The impersonal way is difficult to teach because there is not much that can be said about it. It would be like trying to teach you how to drop a ball or how to move your arm. Explaining it in words doesn’t really help and thinking about it can also be more of a hindrance than a help. In the end we just have to live it. Eventually we realise that who we thought we were (that separate individual who needed to be taught something) was just a collection of memories and habits. Our identities are created from our experiences, our thoughts and our feelings, but they are not who we really are. In order to realise who we really are, what is required is more of a non-doing than a doing, more of an unlearning than a learning. The way into truth is not by acquiring more knowledge or learning more techniques, but by jettisoning the ignorance of the false beliefs which have shaped our lives thus far and by disengaging from the habits and tendencies which keep us bound in the chains of the false self. If we were to ask ourselves the question “why can’t we live in this fast lane all of the time?” the answer would be simple: because we live our lives in a near-constant state of resistance. When we complain, we resist. When we pass judgement on someone, we resist. When we are angry, we resist. When we are attached to an outcome, we resist. We resist life as it is because we have forgotten how to just BE who we really are. When we truly accept “what is” we find beauty expanding within us. We can stay in this experience of ever expanding beauty until we once again return to resistance. We can return to joy and beauty through our spiritual practice. The more we practise the principles outlined in this book, the more we find we can live in this fast lane more of the time. We could say that we grow so accustomed to being in the fast lane that it becomes like second nature to us, but after a while we realise that it IS nature. Being who we are is natural because we are part of nature – indeed we could go further and say we are nature herself. 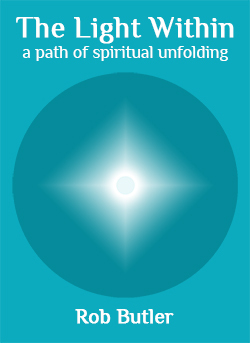 The spiritual journey which beckons is not an outward journey, but a return journey, a journey of going home. Having travelled so far into darkness, it is now time to return to the light. Having travelled so far into forgetfulness, it is time to remember. “Now” is the very doorway which leads to our eternal Self. In the slow lane we experience suffering and ignorance. In the fast lane we experience wholeness and Oneness. To model this dual nature of our experience we can use the metaphor of the eternal Self and the temporal self. The temporal self is the person who experiences life through time. The eternal Self is the essence of who we are which can be “realised” whilst living in a physical body, but which exists outside of or beyond time. The temporal self is changed by time; the eternal Self is forever unchanging. It is well worth “taking the time” to consider that the personal approach “takes time”. It is a journey through time. But the eternal Self walks along with us, everywhere we go, “all of the time”. In the very centre of our being, at the heart of who we are, is our essence, our eternal Self, which exists in a kind of ever-present dimension beyond linear time. Seeing ourselves as having two selves is just one example of how having minds and bodies leads us into duality and separation. It is inevitable that attempting to discuss the relationship between the eternal and temporal selves will lead us into a kind of linguistic paradox, but this should not deter us because our aim is not to create some kind of comforting house of words, but instead to realise the truth: that true spiritual freedom is not something we attain upon the successful completion of our journey like some form of ascension or becoming qualified to enter into heaven or paradise – true spiritual freedom is available to everyone right here and now, every day of our lives, by entering into alignment with our eternal Self. Each day offers us the opportunity to step into the Oneness and feel appreciation for every glimmer of wholeness we feel. As we feed that appreciation we engage in the process of embodying the Oneness into our conscious awareness. In essence we are always whole. The opportunity of having a physical life is to embody that wholeness in our physical expression. Through embodiment of wholeness we transcend the dual nature of existence. We still see polar opposites in the world around us, but our experience of that world is one of unity. In this book the word “self” appears frequently. When we attempt to explain in words what we think we know, it highlights the limitations of our vocabulary as well as the limitations of our own understanding. In many respects the word “self” is perhaps not the best word to use but it is the one which often makes most sense because it is a word to which we can relate. In order to distinguish between the false self and the true Self I shall use a capital “S” when referring to the true Self. This is not to suggest that I believe the spiritual to be more important than physical, but rather to promote the idea that our physical expression becomes more harmonious when it is driven by our spiritual essence. The aim of this spiritual practice is to realise the one true Self and to allow this Self full expression in the physical world. In so doing we move beyond the fragmented experience of having a lower self and a higher Self into a life where the true Self of our spiritual essence is all there is. In this book the terms “who we are in essence”, “true Self”, “the Self” and “the eternal Self” all mean the same – they are simply different ways of referring to what I see as the one true underlying reality. Accustomed as we are to communicating in words we must use them as best we can to go beyond the experience of words altogether. When we experience the Oneness of the eternal Self there is no separation and no duality. There is no definition and nothing to be said about anything. There simply is. But as soon as we attempt to say anything about the eternal Self or the Oneness we are inevitably led into a world of duality and separation. The mind divides and defines, but it is also capable of making connections and joining things together. When we use the mind to talk about spiritual practice, it becomes necessary to use the language of duality. If somebody is asking for directions we need to be able to distinguish between where they are trying to get to and where they are coming from. So, inevitably, in order to guide someone along the path we need to divide the Oneness into parts. Perhaps the most useful of these distinctions is between the inner and outer realities, or inner and outer aspects of reality.